Convert MP3, WMA, WAV, M4A, AMR, OGG, FLAC, MP2, etc. Manage APE files and encode them to any key audio format supported by AVS Audio Converter . See a full list of supported audio formats. Select and convert audio from your video files. AVS Audio Converter supports DVD, MPEG, MP4, AVI, DIVX, MOV, WMV, VOB, 3GP, RM, QT, FLV, etc. See a full list of supported video formats. Convert your audio tracks to M4B format with AVS Audio Converter . Divide them into chapters and add bookmarks. Set up quality level before audio conversion. Prepare audio files for your iPod/iPhone. Edit an audio file and save it to M4R format for iPhone. Make an individual ringtone with AVS Audio Converter . 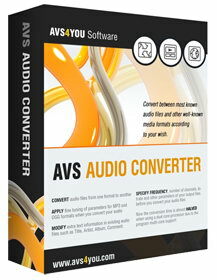 Trim, delete parts, merge files, apply effects with AVS Audio Converter . Modify extra text information in your audio files. - modify extra text information in existing audio files such as Title, Artist, Album, Comment.